I really enjoy the little bits of wisdom in The No. 1 Ladies' Detective Agency series of books, and find myself subtly nodding in agreement. "You are right, Mma, " said Mma Makutsi." We have never had so much happen all at the same time. It is better for things to happen separately. I have always said that." She paused to think for a moment before continuing. "At the Botswana Secretarial College they taught us to do one thing at a time. That is what they said we should do. One thing at a time." This may well be the age of multitasking: we text message, participate in computer chats, listen to music, work, do homework and chores, send and receive email, talk on the phone, and more--all at the same time! It's almost a luxury today to do one thing at a time. Do we feel inadequate unless we're doing several things simultaneously? Is there a shortage of time? Of course, sometimes we have no choice. In the case of The No.1 Ladies' Detective Agency, Mma Ramotswe and Mma Makutsi will not turn down business, and for all of us events in life occur randomly and inconveniently at times. As for me, I have three children, so my own life often feels like a three-ring circus. There's always a lot going on at once. 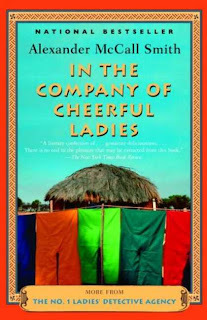 I'm finished reading In the Company of Cheerful Ladies by Alexander McCall Smith. The seventh book in the series is Blue Shoes and Happiness. I've been waiting to read this one. The title alone makes me smile. All of us need gentle reminders to savor life. I think that's what the No. 1 Ladies Detective Agency books do. I also like that both women detectives are comfortable with their 'traditional builds.' Their excellent role models for women everywhere! Well-said, Christie! These books do focus on "the little things" in life that deserve to be savored--a fresh cup of tea, a bit of shade on a hot day, helping someone else, an enjoyable walk, etc.. Perhaps that is why I enjoy--savor--them so much! You're also right about Mma Ramotswe and Mma Makutsi being great role models for women because they're comfortable with themselves.